Malta has a fine and lengthy history for hand-weaving, delicately-patterned lace making and intricate silver filigree work. Three hundred years ago Malta had a thriving cotton-growing industry and produced fine cotton that was renowned throughout Europe. However, this died gradually when agriculturally arable land gave way to human habitation and the volumes became too small to bother about. 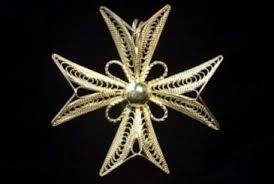 Maltese silversmiths too were a European bye-word and Maltese silver filigree work had a thriving commercial value on the London and Birmingham hall-marked silver markets. As a boy I remember walking through Gozo back streets where almost every housewife took out her stool in the early afternoon, set-up her lace-making equipment and produced the most intricate of patterns. In fact, throughout 150 years of British sojourn in Malta countless gifts of lace and silver ware were presented as gifts to British royalty to commemorate various occasions. These were the three major handcrafts, but there were many others too including clay and ceramic pottery making and tiles, chine boat-building of Maltese fishing “luzzus” and other sea craft, cabinet joinery, making and gilding of religious statues, wrought iron, horse and donkey carts and horse-drawn carriages. 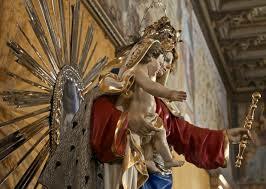 Additionally, in the past Malta abounded with tailors and seamstresses who conducted a substantial trade. Apprenticeships in these crafts provided substantial employment until industrialisation and commercialisation swiftly moved in to render them helpless. Whatever their financial status, most men had at least one tailor-made suit, originally to get married in and then re-cycled to attend other weddings, births, funerals and other formal occasions. A bride would automatically resort to a seamstress for her wedding dress and then this would be re-cycled to make baby clothes and cots. Tailors also made military officers’ uniforms and had a roaring trade in clerical vestments whilst all “respectable” and titled ladies had their own seamstress who additionally thrived on nuns’ habits. Nowadays, priests and nuns are also in rapid decline! Hand-made antique Maltese furniture is so prized it still commands fantastic prices at auctions and house-clearing sales. Unfortunately, many of these crafts – if not all – are in rapid decline and in perilous danger of dying out completely – and modern technology and industrialisation are largely responsible. Well before the turn of the last millennium the necessity that time costs money had already sharply hit the islands. The majority of these handcrafts require considerable time consumption but also have a ceiling price which if exceeded would render them unsalable. In the economies of scale, they became simply uneconomical and industrially manufactured substitutes were equally good – if not as fine – and of course, much cheaper. “The Times of Malta” recently interviewed an Antoine Vella from Rabat who at 47 they claimed was the last surviving weaver operating a loom for hand-woven cloth. As a youngster he used to weave cloth, carpets, quilts and flannel shirts. Nowadays, his main business is rugs. 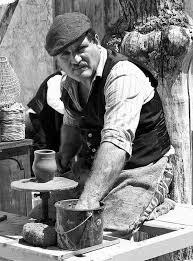 He had apprenticed the craft to understudy his father born in 1908 who had a substantial trade in weaving cloth for the traditional “ghonella” much favoured then as the traditional rustic headwear for village women. The “ghonella” died out completely 45 years ago. Although still highly evident, lace-making has also suffered great decline and nowadays is mostly done in Gozo, mainly as a tourist attraction and for photoshoots. The Government still runs evening classes in lace-making with qualified and very elderly instructors but students are few and far between and those that enrol do so to have it serve as a hobby rather than an occupation. Pottery may have largely died out but at least – and for the moment – this has been replaced by glass-blowing which although requiring modern tools and kilns, still requires a lot of human intervention in the blowing, moulding and decoration stage. There was a time too when economic necessity required households to make their own jams and an extensive range of preserved goods such as capers, cured olives, sun dried tomatoes and many other seasonal vegetables but these too take time and effort and it’s much easier to pop round to the supermarket and buy whatever you need at any time. Such is life in 2015.